With all of the rain that we have had our landscape mulch is quickly decaying into the soil. This is an article that I have provided before, but I think the information in it is worth repeating with a bit of new information, especially about rubber mulch. Mulch prevents loss of water from soil by evaporation, suppress weeds, and moderates soil temperature. It can improve absorption of water into the soil, reduce erosion, and organic mulches add organic matter to our infertile soil as it decomposes. In addition, mulch adds beauty to the landscape. You don't have to remove old mulch when you apply new. Just add the new mulch on top of the old and the old will just continue to decay adding organic matter to the soil. Utility mulch or recycled yard waste - usually available free from Pinellas County Utilities - good for areas that you need mulched but do not what to spend lots of money. It is not the most attractive, however, you can put down 2 inches of this mulch under more expensive mulch to help control cost. Enviro-mulch - is a 100% organic wood product. According to the manufacturer, this ecologically friendly environmental mulch looks very much like a cypress mulch, and is an alternative to cypress, eucalyptus and colored mulches. 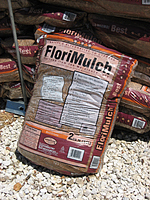 This mulch is ground from all natural, virgin wood primarily oak and Florida pine. Mixed hardwood - colored mulch - This mulch could be ground pallets or other wood by-products. It is dyed many colors, but red seems to be the most available. There is concern that this mulch contains CCA-treated wood that contains arsenic or other poisons. The EPA has stated that chipped or ground CCA-treated wood is a hazardous and it is not allowed in garden mulch. Oak and other tree leaves - this is a great way to use these natural products. If you have large leaves, run over them with a lawn mower to mulch them so that they don't blow in the wind. 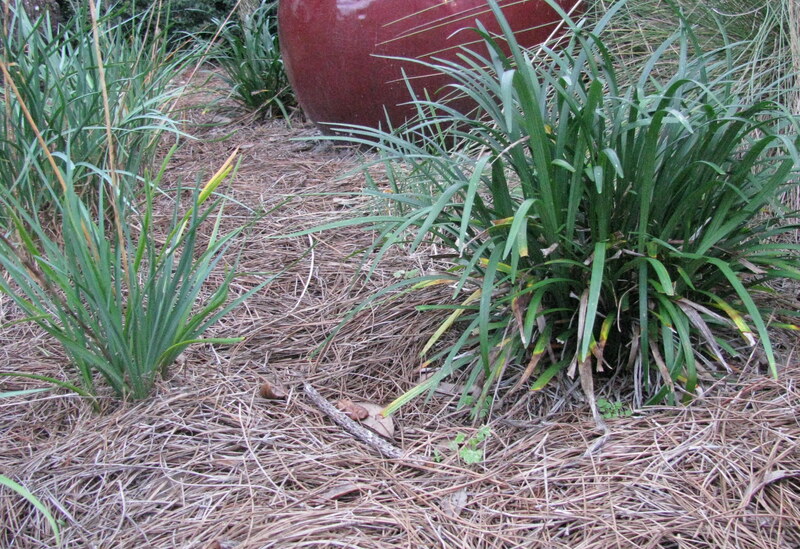 Once in place, they can be covered with a layer of one of the mulches mentioned above to improve the look. Cypress mulch is probably the most abundant in the stores, but I discourage using it because large stands of native Cypress trees are being cut to produce it. It is not farmed sustainably and is not usually a by-product of lumber production. In addition, it tends to mat down and not allow water absorption through it into the soil as well as the other mulches do. Rock mulch is popular with some people and it does give a uniform appearance. Rocks are not organic, so they do not add any fertility to the soil. But, they are permanent and do not need to be refreshed as often. Rubber mulch is good for paths I suppose. However, research at the University of Washington found that zinc leaches out of these mulches at levels that are toxic to plants. There is also concern about chemical leaching when using it in children's play areas and even concern about the volatile gasses which could be toxic that are released when the rubber mulch gets hot. Rufus Chaney of the USDA Agricultural Research Service, after over 20 years of research concludes that on the zinc factor alone, ground or chipped tire material should never be used in gardens or landscaping. I have also read that tire rubber crumbs are being used as bulking agents in commercial compost products. That really concerns me. The Black Kow Compost web site states that they do not add any type of fillers to their compost, so I guess it is safe to use. mulch was the most consumed then Pine. It is recommended that no mulch (wood based or rocks) or a thin layer of about one inch be placed up against the foundation of the house. It is actually best to leave an area of at least 12 inches or more from the foundation mulch free. The termite treatment is in the soil at the base of your house. By placing mulch or rocks over this treated soil, you run the risk of the termites being able to access your foundation without being intercepted by the treated soil. You should not have any plants this close to your house either, so you can use Roundup or another weed killer to keep weeds down in this area. You should be able to walk behind any landscaping around the foundation of your house so that it is easy to inspect whether termite activity is present.